For some reason I always have a really hard time wrapping my head around what to make with flavored chicken sausage. From time to time we pick up a package of chicken-apple or tomato-basil, and I scratch my head trying to come up with something more interesting than grilling them and sticking them in buns. Such was the case with the spinach-feta sausages we got earlier in the week, but I was able to put at least a few of them to good use in an easy crustless quiche. Every so often I make a crustless broccoli quiche with feta and cottage cheese (and will post my cobbled-together recipe next time I do so). This recipe involves more flour—I used my faithful white whole wheat—and a looser batter than I am used to, but it baked up perfectly. I used a big handful of thawed and drained spinach from the freezer because it was all I had available, and similarly had to forego the sprinkle of feta on top, much to my dismay. The sausage that started it all was uncased, sliced, and sauteed briefly with the onion and spinach mixture. The quiche gave me a new problem, however: I had an extra egg white in the fridge, though for the life of me I can’t recall now why that would be, so I used it up in the quiche and consequently ended up with an extra egg yolk that I wasn’t about to waste. I took the opportunity as a challenge to test out another chocolate chip cookie recipe that required an extra yolk: Robyn Lee’s Killer Big Fat Chewy Chocolate Chip Breakfast Cookies, as posted on Serious Eats. The best thing about this recipe was clearly the size of the cookies. It calls for quarter-cup scoops of dough, about twice as much as I typically use for home-baked cookies. 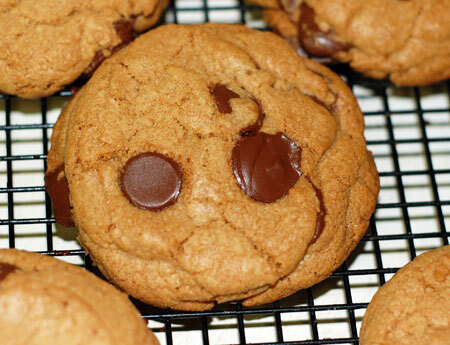 It also makes about the most iconic looking chocolate chip cookies I’ve ever produced: perfectly round, thick, golden, and studded with big bittersweet chocolate chips (see photographic evidence). In case you’re wondering, I baked on my Silpat for exactly 23 minutes as specified, and got exactly 16 cookies out of the batch with a spoonful leftover for the baker’s treat. 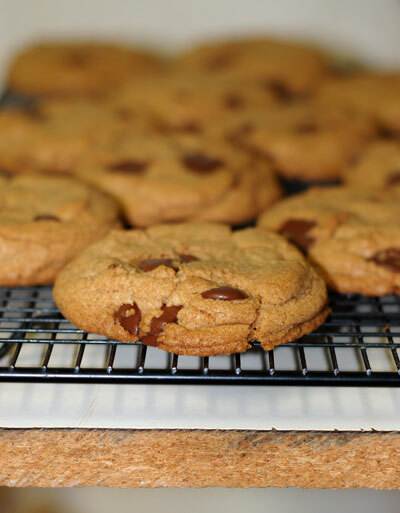 Warm from the oven, these cookies tasted as good as they looked: crisp on the outside and around the edges, with a soft chewy center. Unfortunately, once they had cooled, they hardened up a bit much for my personal tastes, and required consumption with a glass of milk for dunking. That certainly didn’t stop us from polishing them off within a few days, of course! 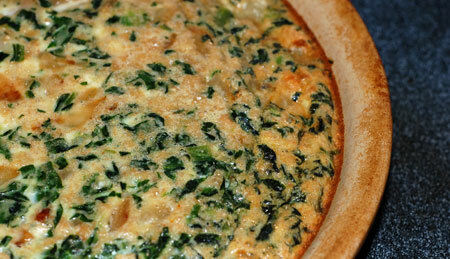 I don’t think I’ve ever had a crustless quiche – I am definitely intrigued now! The cookies do look amazing! I am looking for a logo for a bakery I am opening in Delaware, and the siloutte on your webpage is exactly what I am looking for. Do you own that image? Would it be possible to purchase it from you?